Over the last few years we have heard an increasing number, perhaps apocryphal tales of UK citizens ‘not recognising ‘ the country they grew up in. Feeling alienated in their own country and looking for a way out. Long before ‘the Great Flood’, ‘More Britons flee for a life in the Sun’ screamed the headline in the Daily Express. The UK daily was reporting that many highly qualified professionals, numbering at least 100,000 per year, are leaving the UK for Spain. They are leaving to join the already 1,000,000 plus Brit homeowners who have already relocated to Spain. This sum is estimated to rise dramatically, with predictions that by 2008 over 3.2m Britons will be foreign homeowners. Last year, a Barclays Bank’s survey, suggested that a further 660,000 British people planned to buy in Spain. Why? What is prompting this exodus? The reasons seem to be many; not least that Spain is a great place to live. The primary causes appear a little grittier, a general disenchantment with the UK’s ‘crumbling health service’, ‘soaring council tax and ‘poor education’. We’ve all attended those ‘lifestyle’ shows at the NEC or Olympia where the prospect of 330 days a year of sun, a milder climate for arthritic bones, a golf course for every day of the week, international quality schooling and a magnificently diversity of influences are dangled carrot like beneath our noses. Many of us have said, ‘Can I have some of that!’ yes please’¦..
Well, nearly four years ago, together with my wife and three kids, we decided that a home in Wandsworth, South West London and a partnership in a Mayfair law practice had passed their sell by dates and we needed a new dream. My wife, who had been coming to the South of Spain regularly since early childhood is a very accomplished Spanish speaker – exposure – so to speak – to a succession of Spanish au pairs in London had broken me in – so the location of our transition was fairly obvious. We’d move to the Costa del Sol. Whilst my comments below are drawn from our direct experience and aimed at a Northern European audience we have had significant response to our materials from North America. With certain obvious legal and visa requirements my comments apply equally to our friends on the other side of the Atlantic. After three fruitless and costly attempts to purchase a house in the Neuva Andalucia area of Marbella, we decided to rent – culture shock number one. Lesson One – If you are going to relocate and live in Spain all year round- choose a newer property that has either under floor heating, hot and cold air conditioning and/or tiled or wood floors rather than marble in the main reception rooms. Alternatively, buy an extremely ancient Cortijo or Finca with metre thick walls and stone floors. We rented a five-bedroom villa with a splendid garden and all-important crystal blue swimming pool. It was exceptional for the first months after our arrival in the mid- summer but as the glorious autumn came and went our first winter reminded us that the majority of older properties in the developed South of Spain were constructed primarily for Summer use. That stunning white marble floor had a refrigerating quality in the high summer – it has exactly the same quality in mid winter. And let me tell you when you are used to 35-degree Summers 8-degree Winters feel really cold. Those romantic log fires in October became braziers of necessity in January. Lesson Two – Live on an urbanisation where you have communal pools, tennis and padel courts. For the eleven months we lived in the house in Neuva Andalucia we used that beautiful crystal blue swimming pool for no more than four months. In November to December – when we made no use – an error by me in setting the pool’s heating device resulted in a â‚¬600 electricity bill!! When regular electricity bills were a little over â‚¬100 a month it came a quite a shock. Lesson Three – direct debits – ‘pago domiciliado’ – what an invention’¦..
Our first experiences of ‘gastos domésticos’ – or those usual home bills which required settling monthly was our second jolt of culture shock. Where else would we have happy queued in the bank to be told that we were only able to pay an electricity bill over the counter before 10.00 am and only on Tuesdays and Thursdays after the 10th of each month!! Lesson Four – If you want to get your kids into a good school – and there are a few – you need to book early. 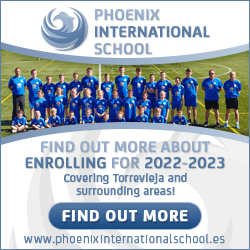 The quality of schools in ‘our part’ of Spain are, perhaps, some of the best anywhere in the World. The problem is lack of spaces. We decided early on that EIC in Elviria was best for our three. Their success record spoke for itself, the atmosphere is warm but very professional and the management excellent. After a brief need to occupy my eldest elsewhere whilst a place became available, in September 2004, all three dressed in the familiar blue and white they started at EIC – a mere 20 minutes or so from San Pedro de Alcantara. Lesson Five – If you are uncertain about the precise location of your dream home – wait and rent – whilst you establish where life takes you. Rental is becoming increasingly competitive and the traditionally lower yields on rented property means that a long-term rental may deliver you a more valuable house more cheaply than purchasing the same property outright. The only caveats being whether you buy for cash or settling on one of the newer style mortgage products that are helping to close this gap. Moving to the beach in San Pedro de Alcantara was literally a breath of fresh air. Our new home, is a bungalow with four bedrooms and suits us perfectly. Or at least it did until my wife – who has a life long passion for riding decided to accept the kind offer of a school Mum to ride in La Cala – 30 minutes up the Coast – past the kids school – towards Malaga. There soon followed my kid’s passion for a Pony – which became their Christmas gift and then, much to my surprise, my own passion for a life in the saddle – I have started to take lessons. Lesson Six – Let someone with current experience of the market place help you to minimise the risk of you making mistakes! I spent 23 years in the UK as a lawyer in industry and then, prior to four years ago, for the last 12 in private practice I had a fairly keen understanding of being a client and an advisor. My colleagues in the Spanish market didn’t habitually appreciate the notion of ‘the client being King’. It struck me that there was a gap in the market for an English style operator. As a result I created – what I am told -is the first relocation focused business to operate in this part of Spain. It’s called The Rights Group SL (TRG) and it assists clients who have a limited amount of experience of Spain to short circuit the process of deciding with whom to work. Through its one stop shop – the TRG Network – it helps clients to determine who’s best to represent their interests in Spain – not just their legal interests but also their accounting and tax, their mortgage, insurance, currency, wealth planning and house building issues. We have noticed over the last few months a significant growth in its business – which we suspect – is as a direct result of UK TV and media pieces which have focused on those unlucky individuals who had been misinformed, ill advised or have become the victims of conflicted interests. TRG’s second but equally important role is to project manage clients dealings in Spain and to ‘drive’ the clients chosen professional advisors, as necessary. A TRG representative effectively becomes the client’s eyes and ears in Spain. They ask the right questions, get the required answers and, in tandem with the chosen advisors, keep the client fully informed at all stages – using electronic communication where possible. 1. The retired or semi-retired couple looking for a greater quality of life and a being able to offer their family a great vacation opportunity. Let me tell you your grandchildren – and the rest of the people with whom you had only a nodding acquaintance with back in you home town – will want to come and visit you when you live in the Sun. 2. The ‘Nomad’ Expat whose work takes him/her to far-flung corners of the Globe. They have usually lived an expat life in the Middle or Far East for a number of years and home base is less important but the UK is not an option. They do want a foothold in Europe, and for some reason France and Italy do not really appeal. They tend to spend perhaps three plus months a year ‘at home’ in Spain and often buy homes for cash earned in tax free zones overseas. Sometimes these relocators may also be a blend of 1. and 2. 3. The Family lifestyle relocation, where the breadwinner works either in the Spain, UK or overseas and the location of the family home can be a question of choice – the quality option. Typical amongst this group are airline pilots and petro-chemical engineers. Whilst the Spanish Costas were once the privilege of the self made millionaires and dubious characters, they are fast becoming very welcoming to those seeking to improve their lives whilst not severing their routes to income in their home market. This means that a business person can locate themselves as well in Marbella as they can Maidstone. As the economy develops on the Costa del Sol so does the jobs market. A barometer of this is the number of recruitment companies establishing roots here and the variety of publications and websites dedicated to ensuring that those who want to work can. The local market is still property, golf and tourism based. We have noticed businesses starting to emerge that serve the Expat markets in the printing, restaurant, magazine publishing and motor vehicles sectors. Above all there is a sense of ‘frontier’ about activities here, it encourages an entrepreneurial spirit and unlike the UK the barriers to entry are not as prohibitive. With the cost of many properties on the desired Costa del Sol reaching the heights equivalent to many a metropolitan home in the UK, this glorious coast has become a ‘first home ‘ market where those who relocate regularly do so on a year round basis. The market is entering a reality phase where prices are stabilising and real value for money is starting to be obtained. With an increasingly sophisticated mortgage market where, although self certification is always possible, many can buy their dream villa, Finca or Cortijo with a chunk of equity from the sale of a UK property plus a mortgage from a Spanish lender at an annual rate in the region of 3.75%. Loans of up to 80% Loan to Value are common and these come with defined periods of interest only payments. Unlike more recently discovered areas in the former Eastern Bloc, Malaga, Almeria, Jerez and Granada airports all remain within the magical three hours from the UK – perfect for combining a couple of meetings in London, Manchester or Glasgow and catching the midweek game at Stamford Bridge, Old Trafford or Ibrox Park before catching the morning flight back home. The infrastructure is exceptional, the roads, the broadband – with many newer hotels and restaurants installing WiFi capability and the simple variety of life from skiing in Sierra Nevada to lounging by the Urbanisation’s ‘ crystal blue gurgling water, to walking the dogs along the many kilometres of beautiful beaches – with a handy poo bag – of course. This is a new coast – it doesn’t have the “age” of the CÁ´te D’Azur and some of the developments have questionable architecture but where else can my kids be on the beach in the morning, skiing in the afternoon and riding into the country at dusk. Unlike the CÁ´te D’Azur we do genuinely have over 300 days per year of Sun and the temperature never dips below 5%! Whatever your life stage, I am confident that you and your family will experience a new lease of life – often out of doors – and you’ll wonder for ever more why you didn’t do it ten years ago. Lesson Seven : Check your financial capacity to buy your new home before you start your search. Currently, servicing borrowings to purchase a property by way of a Spanish mortgage is an attractive prospect for those of you from Northern Europe, particularly the UK, where interest rates have risen in recent months. The Spanish financial services market is in the formative stages of its development – and whilst it is substantially more advanced than the markets of the former Eastern Bloc – certain financial products which are widely available in the UK are simply not available. It may be interesting to note that unlike the UK, in Spain a mortgage secured against a property attaches to the property rather than the borrower. This means that a mortgage may be transferable – subject to status – between a buyer and seller. If you do not want to assume the mortgage, it is important that your legal advisors ensure that mortgage debt is redeemed by the seller before you complete your purchase. If you are a buyer who is seeking to fund your purchase in part by way of a Spanish mortgage, I would strongly recommend that you should work with a recognised mortgage broker to identify your precise capacity for borrowing in Spain prior to narrowing your property search. TRG works with several such brokers and would be pleased to help you to assess your financial requirements before your inspection visit. Please also remember that you’ll need to add in the region of an additional10% of the purchase price of the property selected to cover professional fees, transfer taxes, Land Registry fees etc. Lesson Eight: Learn good Spanish if your dream home is a Finca or Cortijo in the Campo (the Countryside). Don’t be led astray by the promises of an overzealous salesman who assures you that you can build your very own Alhambra Palace on the site of a tumble-down cattle shed – in reality its unlikely. Many works of non-fiction in the ‘Driving Over Lemons’ market have depicted a view of Spanish rural life that is charming, quaint and stuffed full of olive oil soaked personalities who are keen to help the newcomer settle into their neighbourhood. I wouldn’t dare to suggest that this is rose tinted – it’s not – there is an honesty and grit to Spanish rural dwellers that is heart warming. However, they are used to the harshness of the conditions the extremes of the seasons and the lack of creature comforts. Above all they speak Spanish – they will usually have little more than a ‘yes’ or ‘no’ grasp of English – and why should they! i. More than ‘restaurant’ Spanish. ii. An experienced Surveyor – who may be a British trained RICS member or the Spanish equivalent, a Tasador, to provide you with a full structural survey of the property along with recommendation to rectify any obvious failings. iii. A bilingual Project Management team who should be retained early on in the refurbishment process to ensure that you are able to achieve the finished property that you desire. They will handle the entire process including the creation of the architectural drawings and seeking their approval by the Architectural College. They will obtain the relevant building licences and permissions from the planning department of the local Ayutamento. They will exercise relevant control over the builders and their progress with the aim of delivering, most importantly, on time and on price. Finally, if the idea appeals but the reality is just too daunting buy a sea or mountain view apartment, villa or townhouse and drive up to the Campo at weekends and stay at one of many great country house hotels!! Moving house is still, allegedly, the second most stressful activity – next to divorce – that a family can expose itself to. Now imagine co-ordinating prompt and efficient UK or Spanish removal teams to cart your furniture several thousand kilometres to your new home and there to seek to fit the contents of a suburban living room with velvet and mahogany into a whitewashed hacienda. It’s just not going to work. That sofa will become a roasting seat on balmy summer evenings and that mahogany cabinet will look just out of place next too the cool cream lines of your new limed oak or granite kitchen. Through our work in Spain we come across properties that have been crammed with too many knickknacks from the old Country. I am not just seeking to dissuade you from incurring the inevitable cost of exporting used furniture to Spain but more seeking to make clear that at some point you may wish to upscale – or downscale – your new home. One of the member businesses of TRG Network is ‘Start2Finish’ a ‘House Doctor’ service, which is active in the Marbella region. In addition to providing packages of furniture for newly completed off plan properties, they visit resale properties with a view to neutralising bad or outdated taste and ‘dressing’ them for potential buyer interest. Time after time ‘Start2Finish’ is required to advise it owner clients to bin tired or outdated furniture which has been brought over with the purchaser, often many years before. ‘Unloved’ or over designed interiors are – along with price – one of the most noted ‘turn off’s’ for a potential purchaser. Don’t bring all those winter woollies – just in case – the moths will eat them. You’ll not need them. Usually, in newer properties wardrobes tend to be built in – so you don’t need to bring hefty wardrobes with you – and as space is usually at a premium you’ll want to rationalise your clothes to lighter cottons and linen with the occasional fleece for winter days. Lesson Ten: Let an experienced agency try to minimise those frustrations attendant in moving to Spain by dealing on your behalf with the utilities. Whilst there are many estate agencies on the Costa del Sol that will happily sell you a property only a relative few will offer the necessary after sales service that is so vital for your comfortable settlement into your new home. Following your move – a tiring experience for many – you risk immense frustration by encountering the bureaucracy of Spanish businesses. Telefonica – Spain’s main telephone line supplier, Sevillana – the electricity company and Acosol – the Andalucian water company are just three of the main deliverers of stress overload for the new settler. Let’s be clear. No one holds the key to the golden door when it comes to dealing with the utility companies. They are unwieldy mammoths who have been allowed to become complacent and unresponsive to customer power. Being aware that they have many non-Spanish speaking customers Telefonica has introduced an English language service, which seems only intermittently, manned. When finally answered you find yourself in a vortex of confusion, repeated instructions and delays that only serve to fray the nerves. The answer is to speak to them in their mother tongue – in the South of Spain: Castellano. Lesson Eleven: If you want to continue to work via the Net you’ll either need an office in a commercial centre or to live in a more developed neighbourhood – like most urbanisations – with good and close connections to main roads. My impression is that the quality of the technical infrastructure is good with much of Spain benefiting from fibre optic cabling but it should be noted that there seem to be geographic limits as to where one may receive the ‘super highway’. I have to couch this carefully as no one I have spoken to seems to been able to fully explain the system, but it appears that ADSL and broadband are unlikely to be available to a residence which is more than four kilometres from a main road. Lesson Twelve: Use the services of a reputable Lawyer or Abogado in order to properly understand the transaction you are entering into but also ensure that they are responsive to you. Always be tempted to question things you don’t fully grasp on first hearing and take notes during meetings. As the Land Registry system in Spain is very well developed many Spaniards do not bother to use the services of a Lawyer or Abogado to handle the conveyancing or property purchasing process. Such an approach for me is simply unthinkable. Let’s face it wherever you buy a home you will be sinking into bricks and mortar a substantial chunk of your family’s net worth and it is simply not prudent to do so without the input of an expert. The most basic checks that simply must be made include the following: Is the person selling the property actually the owner according to Land Registry records? Are they up to date? Is money owed to a mortgage lender out of the proceeds of sale? Are local taxes or other domestic utility bills outstanding? Is the plot subject to a compulsory purchase order? Is there a license for the property that has been built on the plot and does it conform with the building regulations both in terms of density – its m2 expressed as a fraction of the whole plot – and its construction? These and other questions of fundamental due diligence must be asked by your legal advisor. Your lawyer is handling a process but whilst he or she must certainly be competent and properly bilingual they must also be responsive to your reasonable requests for clarification. Please don’t be tempted to save the cost of responsive and good quality independent professional advice. Horror stories persist – particularly in the newer development areas of the Costa Blanca. Clients of TRG, who came to us too late in the process, had been guided by a willing seller’s agent into signing a ‘Private Purchase Contact’ and paying a deposit to with a party whom was neither the developer nor promoter of a new block of apartments. No bank guarantee was given to secure their deposit and no land was ever acquired. And as for the client’s hard earned deposit, well it was never seen again’¦.. Choosing a lawyer is a fraught process. For every person who recommends a particular firm another will have a contrary view – whether or not it’s based on actual experience. I suspect that may be the nature of any reasonably small community. In any event I recommend that you avoid a lawyer who is recommended by an Estate Agent. However good they are they can not escape an obvious conflict of interests which may not be in your favour. As the presenter of one of those TV shows that reconstructs gun crime hold ups always says – ‘we don’t want to scare you into believing that you may become a victim ‘ – our aim is to say how it is from our increasing experience of the very good life in Spain. Superstition dictates that I must call this Lesson 12 a – although the number that follows 12 in Spain is lucky – The rain rarely falls in Spain. When my wife, Andrea, and I decided that it would be a major improvement in our family’s lifestyle to relocate to a new country, as I had lived and work for a Law Firm in Paris in the early 80’s, France seemed an obvious candidate. For many years a January business trip involved attending the MIDEM festival in Cannes in the South of France. It had rained stair rods for most of the years I had attended but I brushed that aside as ‘Well that’s January for you!’ I had seen the Cote d’Azur in all its Summertime glory on many occasions, reflected in the turn of the last century works of F. Scott Fitzgerald and more recently I had been further seduced by the slightly Disneylandesque view of Main Street, France, the region called ‘Provence’. We are clear that midsummer water supplies are at a premium. This brings minor inconveniences but until the local desalination plants are working at full strength we will need to be cautious. The advice is simple. If the weather in your home country is a major reason for your proposed relocation, and it is, for many from Northern Europe and North America, then do your research and see whether you can better Spain’s Costas and their perfect Mediterranean climate. Lesson 14 – To add to the pleasure of Spain why not taste it! For many the nadir of European cookery is the finest French Haute cuisine or the friendly and more rustic Italian Trattoria menu. Whilst I really do appreciate the excellence of both, Spain’s signature dishes and exceptional wines, particularly the red (vino tinto) from the Autonomous Regions – that comprise mainland Spain – are no longer a poor third. The Mediterranean Diet with its emphasis on fresh colourful vegetables, smashing fish and meat dishes, inventive ‘Tapas’ plates and the extensive use of fine Olive oil is not the preserve of Spain’s coastal neighbours. Although, I am certain that there will be many who’ll bemoan my releasing this information to a wider public, but the risk of passing on the pleasure will out way the burden of disclosure. There are many excellent ‘Ventas’ in most rural and metropolitan areas that serve the very best local specialities. These are café bar type establishments that open from early morning for coffee and toasted bread, which you may like to grate with a fresh garlic clove and spread with a light tomato puree, a sprinkling of sea salt and olive oil, serving many steaming plates until well after dark. At lunch time, a favourite time for most Spaniards to eat, a ‘Menu del Dia’ (Menu of the Day), often priced as low as â‚¬7 ($8 or Â£5) for two or three courses and a drink is possibly the cheapest and most nourishing way to taste Spain. The starter of a classic Gazpacho soup, definitive Mediterranean cookery and basically ‘health in a bowl’ is a must! Lesson 15 – Following two years on from our Lesson Eight – Learn and speak as much Spanish as you can. Unlike the usual French maxim of ‘it doesn’t matter what you say as long as you pronounce it correctly’ most Spaniards realise that if you are from an English or Germanic language heritage the chances of ‘school boy’ Spanish are slim. Consequently, in making the effort to acclimatise to your new home, complimenting your expat life with a decent level of spoken Spanish can only prove advantageous. In working here I have had to develop a slightly more detailed understanding of the language and it’s been easy to massively embarrass myself in formal meetings conducted in the native language. However, the encouragement that I have received has generally meant that although there’s a level of ‘it’s the foreigner who’s trying’ good hearted gibes it’s a small price to pay and an immense source of satisfaction when you get it approximately right. I should point out that when I refer to ‘Spanish’, I am speaking of Castellano which is that form of Spanish spoken by most of the regions of Spain with the exclusion of the Catalunya region. Centred on Barcelona, the locals speak a distinct language called ‘Catalan’. I am convinced that although it is theoretically feasible to practice law in Spain as a non-Spaniard, the Legal System – which differs from the UK and US ‘Common Law’ system – and is based on the Napoleonic Codified Civil Law – mitigates against playing on an even pitch with my local colleagues. As a non-Mother Tongue Spanish speaker it is clear that I may even be a hindrance to a foreign client. There is a somewhat ‘Civil service’ mentality to the administration of ‘life’ in Spain. It has proven much more efficient and substantially more advantageous to our clients for me to work through our legal colleagues within the context of my professional services solutions provider business. The Costa del Sol is known by many as the ‘California’ of Europe. These two regions have much in common. As a dictionary definition the expression ‘Californian’ conjures up an image of sun and a bohemian lifestyle. ‘Laid back’ or ‘Taking it easy’. Well Spain has the same scheme, particularly in the South and it is summed up in the expression ‘Mañana’ (‘Tomorrow’). A shrug of the shoulders and a sense of resignation that ‘its out of my hands’ can drive the average expat mad in bewilderment and frustration. A failure to learn, early on in your relationship with Spain, that the more you push the incrementally more difficult your dealings will become, is a recipe for disaster. You cannot shout at a Spaniard and expect to amend their stance – they won’t. No matter how big you ego is, it will be totally deflated by a Notary’s cashier or shop assistant – I know this from experience. However frustrating, responding proactively to a complaint is just not within the litany of many Spaniard’s reactions. As Spain’s First Minister, Jose Luis Rodriquez Zapatero is alleged to have remarked recently that he is the head of a country comprising over 40 million ‘First Ministers’. This tells us something of the national character. In our working lives we have been able to ‘soften the blow’, as its one of our prime roles to ‘drive’ the relationship between the advisor and the expat client. We cannot provide a totally stress free Spain -it really is part of the nation’s charm – but we do work with some excellent advisors who really do make the difference for our clients. We have known of people for whom the dream of Spain didn’t translate to the reality. They are rare but a couple who I know recently returned to the UK cited the System as being a major contributor to their unhappiness. Albeit a complete generalisation Spaniard’s seem to know how the System can be made to work in their favour. Their logic is infallible; they ‘Work to Live’ rather than ‘Live to Work’. Lesson 17 – Give Flamenco a chance. At the risk of offending the heritage of our friends and neighbours – particularly those from the Celtic regions of Northern Europe – no distinct musical style is more definitive of its homeland than Flamenco. Whether it’s the guttural signing – which a really acquired taste – the whirling dancing, a prancing horse or a bright guitar chord, Flamenco is a brand and for any marketing executive it is short hand for Spain. My suggestion, and a topical cure to this inevitable decent into becoming pro Spanish, are the CDs ‘Chambao’ and ‘Ochos de Brujo’. The skill of ‘Chambao’ is to marry more traditional Flamenco phrasing and style with a modern techno beats to produce the coolest chill out music – see the advice given in Lesson 16 above – currently available on my in car CD player. Lesson 18 – The Life/Work/Play/Family balance. In moving to Spain, although I suspect that I did work fairly hard in London the workload I have had since opening our business in Spain has been fairly intense. As a consequence I have had to explore an ability to blend the elements of life such that one doesn’t submerge the others. I am starting to learn, and am aware that I have yet to perfect this skill, but acknowledging that something exists is the start of finding a solution. Unlike much of the time in London, at least my kids now know me by sight! At least that’s the theory’¦. Getting it right will take time but it’s already a more satisfying way to live. Lesson 19 – How to avoid losing out in making an ‘off plan’ purchase. You’ll have seen the wonderful images at the Property Show in Manchester, Leeds, Glasgow or Dublin and you’ll have been very drawn to the idea of getting in early on the ground floor of this fabulous new development on the Spanish Costas. And why not – these developments often present really good value for money and, as you are getting involved early, pre-construction, you are potentially making real savings. You agree to take an inspection flight, which, in any event, even if you don’t buy an apartment is a bargain weekend in Spain. You arrive at the chosen destination and it all seems to stack up – you are ready to buy’¦’¦. Whatever you do, obtain independent legal advice on the ‘Off Plan’ property before parting with any cash or a credit card deposit. We would recommend that you do not use either the developer’s own lawyer or a lawyer who has been referred to you by the developer’s or estate agent’s sales team. There is an obvious conflict of interests and whilst he or she may be highly qualified there will always be a nagging doubt in your mind as to whether you are receiving the ‘best’ advice. Although this is becoming common practice in the UK market, the level of regulations, ethics and recourse available to protect you in the UK are not available in Spain. Having received advice from your lawyer that the ‘off plan ‘ development is not at risk from any legal flaws which would prevent it being built, you may now be ready to hand over the 20% or 30% deposit required to secure your chosen apartment, town house or villa. Before parting with your hard-earned cash there is one further check that your lawyer needs to make. Most reputable developers will have provided you with a sales pack containing the Private Purchase Contract – which may be in English as well as Spanish – relevant details about the property number you wish to reserve, the complex to be built and a copy of a Bank Guarantee document. The Bank Guarantee should be from a reputable Bank and needs to clearly state that your cash will be held in their accounts and will only be released under certain conditions. In addition, it must provide that if, for whatever reason, the developer fails to build the complex that you will receive your cash back – together with – hopefully interest calculated on the amount lodged. We have seen situations where purchasers have been told that a Bank Guarantee exists but they have not asked to see it – and when the property was not built the deposit was lost. Wording in some Private Purchase Contracts may be tricky. Developers often fund their developments by borrowing from Banks – no surprise there. The Banks think that if they are in play when you come to secure an apartment in a new complex, you will be prepared to take over the existing borrowing on that apartment. In other words you take over the developer’s mortgage. This is as opposed to seeking a mortgage for the completion funds on the open market. The ‘assumed’ mortgage may well be more expensive than that you could get on the open market. In addition, in an attempt to dissuade you from seeking your own funding the Bank may have imposed a premium or more accurately termed a penalty on the developer – usually 1% to cancel the funding – which in turn the developer passes on to you under the terms of the Private Purchase Contract. Beware, you may be required to agree that the penalty is added to your costs of purchase if you elect not to take the ‘assumed mortgage’. In other words you are penalised by the developer if you chose to seek you funding elsewhere than take up the offer from the developer’s Bank. In eighteen months to two years after placing your deposit – if all goes well, and Spanish builders do build quickly – you will be given notice by the developer to complete the purchase. Notice may be as short as two weeks. However you must be ready and willing to do this as failure to do so will probably leave you forfeiting your deposit. Your purchase price will be fixed at the Private Purchase Contract stage, so together with between 10% to 12% of additional costs, which primarily is a purchase tax but also includes Lawyers and Notaries fees you should be clear on what you’ll need to pay at completion. A copy of your – and any other joint borrowers – passport or residence card. Copies of NIE – a registered number needed for a foreigner to make a purchase in Spain, The Nota simple – the extract of title from the Land Registry for the property The last years bank statements showing income or your last two P60’s or last tax returns An employment contract For the self employed you’ll need copies of you last three years of accounts and bank statements showing the income. Once completion has been requested you should view the property and make a complete ‘snagging list’ of any issues or problems that are obvious with the property. Should your developer fail to address these our recommendation is to give formal notification – preferably through an independent lawyer – to the developer asking them to resolve all listed problems. If they continue to refuse the solution is for the purchaser to rectify the ‘snags’ using another contractor and to pay for the work at their own cost. The amount paid should then be claimed from the developer with the ultimate sanction being to issue judicial recovery proceedings if they fail to pay. This may work best particularly where a number of new owners complain and their complaint can be properly co-ordinated through a single lawyer or committee. Buying in Spain is not just about putting a deposit down and waiting two years for the completed property. Many satisfied clients have bought what are called ‘resales’ which are pre-owned apartments and houses. The main reasons for this tend to be issues relating to getting better value for money, particularly villa properties. B by purchasing older you usually get a much more mature property and garden with the teething troubles of a new property already out of the way. Additionally, the location may be a little more established where no further building work is permitted. Often when buying a ‘resale’ in Spain paying ‘black’ or ‘B’ money is mentioned. This enables the seller to evade tax – by artificially reducing the declared price of the property and thus the capital gains tax due. However, the Spanish Government is toughening up its approach to this kind of Tax fraud. Let’s make no mistake however accepted this practice is at a ‘social’ level it is still in breach of the law and at a personal level the vendor is passing on their part of their tax bill to the purchaser! The concern however is that if you refuse to accept this as standard practice will you be able to buy the home you have set your heart on? The sensible advice, and the most prudent conduct, is to refuse to deal in such a manner. Despite putting your ‘dream’ purchase at risk the potential pitfalls from a personal criminal liability and resale point of view are worth avoiding. By doing so gradually the swell of opinion away from such sharp practices will reduce the expectation that all buyers are prepared to flout the law.